THE WRITER’S EYE is the first in a six part online creative writing programme called WRITING THE CITY, written and presented by Singapore Literature Prize Winner Suchen Christine Lim and UK author Jeremy Sheldon. Through the series, Jeremy and Suchen will be taking you through the concepts that lie behind creative writing and inviting viewers to respond to each concept through a writing task that takes as its starting point the relationship between writing and the urban environment. 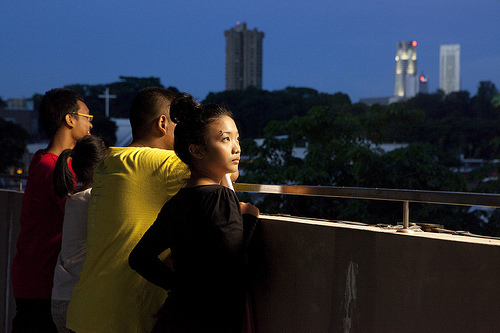 THE WRITER’S EYE is directed by Singaporean filmmaker Victric Thng, and was filmed in the hawker centre of Tiong Bahru, the inspiration for the Civic Life: Singapore project. Listen to a two-part interview with Suchen and Jeremy by clicking on the links below. A number of films entered in our WHERE THE HEART IS competition may also serve as inspiration for your writing. Check out these 90 second treats below! You can see the other films in the series by clicking on the links below. Watch Episode 1 of the series, The Writer’s Eye, here. Watch Episode 2 of the series, Characters, here. Watch Episode 3 of the series, Encounters, here. Watch Episode 5 of the series, The Magical, here. Watch Episode 6 of the series, The Individual And The City, here. Watch a P.S. to the series, Looking Forward, here. Throughout the Civic Life project in Singapore, leading writers have shared their thoughts with us on ideas of identity, belonging and community. You can read three pieces, which feature in the booklet accompanying the TIONG BAHRU DVD, below. Ng Yi-Sheng on the ever-changing landscape of Singapore. Alvin Pang on a geography of Singapore mapped through personal reminiscences. Tan Shzr Ee on the rich linguistic identity of Singapore and Singaporeans.